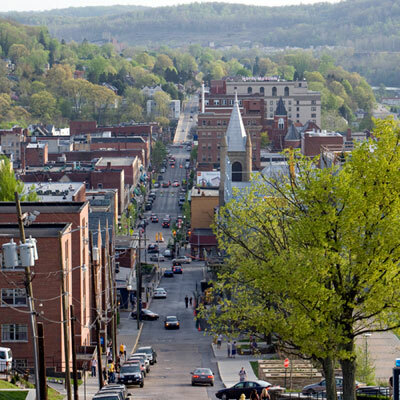 Nestled on the mountainous banks of the Monongahela River, Morgantown resembles your typical American college town, with clusters of historic brick buildings, tree-lined streets, and a bevy of sports bars, funky shops and restaurants. It’s clear when you drive into Morgantown that this small city – often referred to as Touchdown City – eats, sleeps and breathes Mountaineer sports. With nearly 30,000 permanent residents, the population doubles 9 months of the year when the students take up residence, migrating to Morgantown like humpback whales to the subtropical seas. So while Morgantown embodies small-town appeal, it has the traffic congestion of the Big Apple. 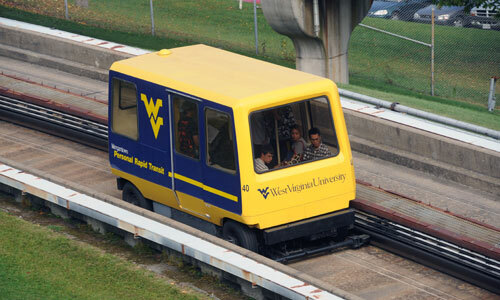 To help cut down on that congestion – and to connect WVU’s 3 campuses – the university has the world’s only personal rapid transit (PRT) system, whose tracks wind about 9 miles through the campuses and downtown, skirting the Monongahela River along the way. These gold and blue, electric powered cars resemble miniature buses that carry you from point to point. Kiplinger has rated this picturesque place #7 on its 10 Great Places to Live, and Business Insider has ranked it as the 12th best college town in the U.S. Morgantown has also received accolades from Forbes magazine, Sporting News, Inc., Budget Travel and Campus Explorer. For a complete list of awards, visit the City of Morgantown website. Morgantown is within easy traveling distance of Pittsburgh, Washington, D.C., and Cleveland and Columbus. If you’re flying, I recommend you fly into Pittsburgh, rent a car and drive the 60-75 minutes to Morgantown. United Express also operates commercial flights to and from Morgantown Municipal Airport and Dulles International. If you’re coming to Morgantown during football season, expect to pay twice as much for a hotel. You’ll also want to plan ahead because if you don’t, it may be next to impossible to find a room within close proximity of the stadium. Priceline has a list of Morgantown hotels along with their distance from Mountaineer field. If you’re a fan of historic hotels, you may want to try the Clarion Hotel Morgan in downtown. It’s also really close to a PRT station if you don’t want to drive to the stadium. While the PRT is free for students, it costs 50 cents for the rest of us on game day. But you can take it from downtown to either the Towers station (if you want to stop by our tailgate in the Gold Lot) or Health Sciences. The Chestnut Hotel is Morgantown’s new boutique hotel. I haven’t stayed there, but it’s also in a great downtown location and very close to the PRT. 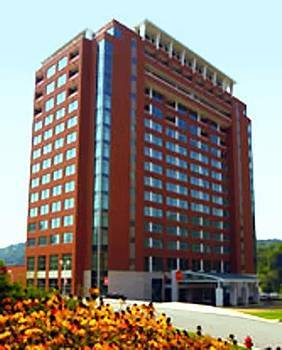 The Waterfront Place Hotel & Conference Center is a beautiful, 16-story hotel located in the Wharf District. Not only is it close to nature and some great restaurants, you can easily access downtown from there. There’s plenty to do on a weekend in Morgantown. You can start with outdoor dining in the Wharf District along the Monongahela River. Then, if you haven’t consumed too much food and libations, you can hit the Rail Trail, a nice paved trail along the river that’s great for walking, running and biking. 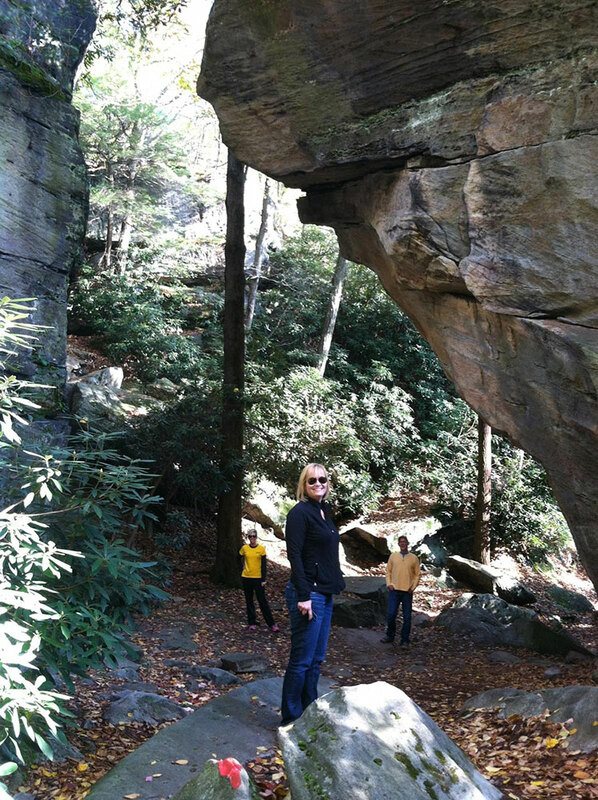 If you’re the more adventurous type, you’ll want to head 13 miles east of Morgantown to the gorgeous Coopers Rock State Park. This nearly 13,000-acre forest offers camping and picnicking facilities, rock climbing, fishing, and nearly 50 miles of hiking and biking trails. In addition, its southern edge abuts Cheat Lake and the canyon section of Cheat River, which is a popular whitewater rafting river. Of course, there’s also ample shopping if that’s more to your liking, with a great collection of specialty boutiques downtown and at Suncrest Town Centre.